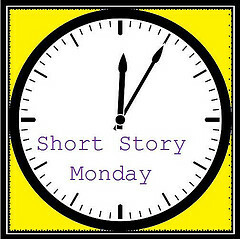 For Short Story Monday, hosted by John at The Book Mine Set, I read Georgia Coffee Star, written by Kerry Clare. Clare blogs at Pickle Me This, definitely a blog worth subscribing to. Georgia Coffee Star is the story of a couple on their way home from backpacking through Asia, staying in Tokyo on their last night. They have spent a bit too much time together and it has taken a toll on their relationship. Then a typhoon hits, surprising them, but not enough to comfort each other. Even a sign falling and crashing into their window doesn't shock them into each other's arms. Clare is deft at describing the complacency this couple has fallen into, and their relationship rings true. Even in this short format Clare is able to show two character voices and both of their views on the relationship and each other. Expats in Japan are notoriously hard on English fiction set here, and I am no different. But this is the second time this year that I have had the pleasure of reading something set in Japan that I don't want to tear apart (after Sora and the Cloud). I quite enjoyed the descriptions of the typhoon I didn't have to experience. I too was caught unawares by a typhoon soon after arrival and it was quite surreal. This is one of the best short stories I've read in the last year, no wonder it won the UofT Alumni writing contest. Had no idea Clare wrote short stories. Bookmarked it-- definitely looking forward to this! Wow, I will have to check it out! It sounds quite inticing. I love it when an author can really get to the heart of a character/relationship in a short story. This definitely sounds worth reading, thanks! Wow. I just saw this now and want to say thank you for your considered reading of my story (and for sharing it with others). And I'm so glad to have been reading your blog lately-- I lived in Japan during 2004-2005 and have been missing it ever since, so your adventures are a bit like home to me. And yes, there's the picture book passion too. Wonderful stuff. International Book Giving Day - February 14th!